Tickets for the home matches against Scunthorpe, and Rochdale (Gold Game) are now on sale. The away matches at Oxford and Gillingham are sold out. All home matches, cup or league, are classed as "Silver Games" unless stated. Both the West Stand and East Stand wheelchair bays are available for all home cup matches this season. Entrance and exit to the East Stand will be via the Sam Bartram gate in Lansdowne Mews only and, as the catering outlets in this stand will not be open, I would suggest you make alternate plans if you require food or drink during the game. Parking spaces are available behind the Sam Bartram gate. Information on the Season 2019/20 ticketing system can be found here. A fee of £2.50p will be charged for every telephone transaction. The online booking page is available here. Lift Passes are issued with each disability season ticket where required. The lift pass can be collected from the West Stand reception on the day of the match. should arrive at least 15 minutes before kick-off. Access is free to home matchday/season ticket holders. 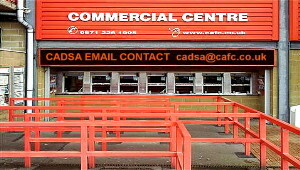 Charlton Athletic's ticket pricing policy is consistent across all disability groups, with the disabled supporter being the one who pays, while essential helpers gain free admission. Tickets are available for the whole season as well as on a match by match basis and various discounted "multiple match" tickets are available throughout the season. Charlton have 96 wheelchair spaces available for home fans and 9 for away fans. and these seats will be no further than three rows from an access point or gangway. The ticket office's instructions on selling disability tickets are shown below. In addition to these details, any disabled supporter who has chosen not to claim any of the benefits shown should contact the Commercial Centre, or contact our DLO for details of the procedure required to buy disability tickets. Information on the number of seats available for ambulant disabled supporters can be found at: Level Playing Field. Click on "clubs/venues" > "football" > "league 1", then click on the club you require.